Constantine III or Constantine VII? Illig also reports on the conspicuous similarities between the Byzantine state of affairs of the 7th and the 10th centuries. “Around the year 600 AD the advancing Avars weaken the imperial realm militarily on the Balkan peninsula”, he writes. Let us not forget: with the correction of the 300 years the time of the advancement of the Avars coincides with the advancement of the Magyars. Since Byzantium will need to involve itself in another conflict with yet another strong northern enemy, this time in the beginning of the 900’s and the Magyars, there is a strong suspicion that the entire Avar era is nothing but a chronologically predated duplicate of the Magyar reconquest. Illig refers to Manfred Zeller, who in his work about the steppe peoples points out: “the number of these horse peoples doubles in the 1st millennium, filling up the empty centuries!” Hence the Avars are simply just a duplicate. They are nothing other than a nation created from one of the adjectives used to describe the Hun-Magyars and its only purpose was to fill out the empty centuries. The rich archaeological finds admired under the Avar name might as well be the legacy of the Huns of Attila. Very strange it is that the author of the Chronicon Pictum manages to find the Byzantine emperor at the time of the Magyar reconquest to be an emperor living in the 600’s! As we know, according to the theory of Illig the fictitious centuries start the year 614, that is, not long after the capturing of the Holy Cross. Constantine III is already crowned co-ruler, yet he is only three years old. The time when he comes to genuine power, actually already takes place in the phantom era. If Illig’s theory is correct, then Constantine III has to appear in some form also in the 10th century. And lo and behold, the miracle of miracles, in the 10th century we again meet a Constantine – true, this time not III but VII! Indeed, it is the very Constantine VII Porphyrogenitus who in all likelihood was one of the creators of the fictitious centuries. After all this, Illig starts to examine the 10th century life history of Constantine VII Porphyrogenitus. The story begins somewhere at the start of the 10th century, when pope Leo is widowed three times within four years, before Zoe gives birth to an illegitimate son. After crowning this boy co-ruler the year before, Leo dies in 912. (It is worthwhile to point out that according to the theory of Illig history starts again in 911, therefore, at the time of the crowning of his illegitimate son in 912, we are again witnessing genuine history take its course!) This boy rises to real power very late, 24 years after his coronation, meaning that up until then others were managing the affairs of the realm, which obviously must have stung in the eyes of the young emperor. In this regard he resembled very much Constantine III, who also got his hands on the governmental reins rather late, and who also was crowned co-ruler by his daddy, the emperor. At this point who do you think was the illegitimate son of emperor Leo of the 10th century? Indeed, none other than Constantine VII Porphyrogenitus himself! So there is a conspicuous similarity between the lives of the Constantine (III) of the 7th century and the Constantine (VII) of the 10th century. 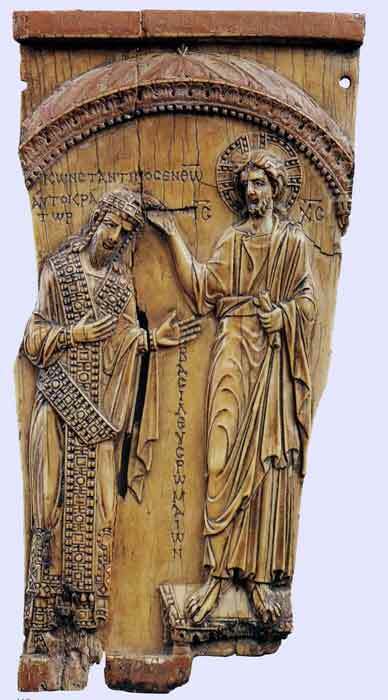 It is interesting to note, that Constantine VII Porphyrogenitus gives the credit for repossessing the Holy Cross from the Persians not coincidentally to Heracleitos, since by this act he honoured his own (7th century) father, paying homage to his memory. Due to the fact that Heracleitos, by being the father of Constantine III of the 7th century, was in fact also the father of Constantine VII of the 10th century! On top of it all, Constantine VII Porphyrogenitus manages things in such a way, that the genuine history more or less starts again from the time of his own coronation! During the course of their conquests in Egypt the Persians became acquainted with the Quran and with it also with Islam and thus moving westwards they took them both with them to Spain. At this point it might not be a waste if we take a little detour and examine in more detail the circumstances of the birth of Islam, even more so, since during the course of our research we will also get an answer to the question why it is exactly 297 years that were inserted into our history. To thine ownself be true; And it must follow, as the night the day, Thou canst not then be false to any man.